Jeff “United in Time” with his father Charles M. Jessie (Jessee) above, followed by a additional photos of Jeff and wife, Patty, with his half-brother and his family in Hawaii. Originally, I thought I had not been born, upon finding out that I was adopted. Then of course, I went through the adoption angst stages, why was I put up for adoption, who were my parents, how in fact did I become me from them? I wrestled with these unknown questions that had no answers. I was told I was born in Honolulu Hawaii, in 1951 that my birth mother was Japanese and my father of German descent; he was in the Navy and my original name was James Naka, that is all the information I had for over 60 years, it was also for the most part all wrong! I met my wife, who at the time was Patty Joy Rosa, in 1996, the meeting and subsequent marriage is a story for another time, it is as magical and surprising as this one is. Shortly after getting together again with Patty, she became Interested in my adoption. She made it her mission for the next twenty years to locate and know who my birth parents were! I was a reluctant and mostly uninvolved second party. Patty was nonplussed by this; though at certain times, especially when she was particularly stumped, or frustrated in her search efforts, she would remind me that this was for my benefit and a little more interest and participation in what she was doing would be greatly appreciated! This would always motivate me in trying to assist in her search efforts, but my involvement was sporadic at best. In 1996 home computers were either unheard of or for the well to do folks, or the closet geeks, none of which we were, so our quest began by writing the State of Hawaii and requesting all the records that we were allowed to receive, which when they arrived amounted to a generic birth certificate that had my time of day, and year of birth, state of origin and that my unnamed mother was Japanese, and unnamed father was German, that was it. We also received court documents that if we wished to pursue the adoption records, we would have to submit a check and validated signature by a notary requesting them; and that we could be required to appear in the Honolulu District Court to be granted this right. The fee was $300.00 per parent, with the proviso that should either one of the living parents deny the request for information, (which was written into Hawaiian Law), then I wouldn’t be allowed to see the parental adoption record. Some many years prior to all this, one of my adopted sisters was snooping around in my adopted parents’ bedroom closet, don’t ask why, I certainly didn’t, and came across our adoption papers, mine happened to have what I thought was my real name-James Naka! When Patty started on her Cervantine quest this was the name that we started with. So, we would call the Hawaiian phone information center and want all the numbers and addresses to all the Nakas' in Hawaii. The phone company would only give 3 at a time, so we would write and call faithfully every weekend detailing our reason for calling or writing, we did hear back from one Naka, a Dentist, who expressed his kindest sympathies and wishing us luck in our endeavors to locate my missing family, but he was not the Naka we were looking for! At least he wrote back most of the others did not; no surprise there. The phone conversations were always awkward, having to explain in detail why this complete stranger was calling them, asking personal questions, and interrupting their lives with the false hope of discovering my mother or father- I always wondered what they thought and said after they expressed their sorrow that they were not the ones and hung up. Well the years rolled by and we would put it aside, as life had a way of intruding in our forlorn search. Then computers became accessible, and what a wealth of information they could provide at ones fingertips! Hawaiian court documents became very easy to discover and comply with, though the cost of going through Hawaii’s own PI Agency was prohibitive. Ancestry was the next big site discovery for us! We joined and started tracing Nakas in Hawaii. Patty had narrowed down a family with 3 daughters and had a 1940 census that seemed to coincide with proper births and ages that would match my mother’s! Also around this time a new site: 23 and Me became available. Patty asked if I would be willing to submit a DNA sample. She had joined some of the adoption groups online and they had said that it sounded very promising and would be beneficial in finding my missing parents. I of course agreed rather skeptically. I would sign up with three of the DNA companies. We received the first DNA package from FTDNA one day in the mail and I spit into the tubes and off we sent the sample-it would take 6-8 weeks for us to receive the results-in the meantime Patty had been doing her detective work on the new 23 and me site and concluded I was a Mc Donald, I thought I was more a Jessee! Patty at this time also found the Jessee genealogy site as well, and joined us into that site. One day Patty was notified that my DNA results were in-we excitedly looked and started to trace my origins-William Jessee had posted his and to our surprise I matched his rather closely. So for the next few years Patty would doggedly pursue and try to trace my lost lineage. Patty had printed out the John Jessee family tree by this time, and what a tree it is-half of Virginia it seemed to me owed their existence to this namesake-Patty traced me, (if in fact I was a Jessee), back to Martin Van Buren Jessee! Well, by now it was early 2016, and although we had educated surmises we were still no closer to solving the puzzle than we had been- I was either a Naka, a McDonald, or a Jessee-it was very hard to say indeed. We were sitting in our family room one night when Patty turned to me in a way I was very familiar with and said “Jeff, why don’t we just pay the PI and get your records!” This sounded like the best solution to me as the last 4 years had yielded nothing but tantalizing hints with no actual hits-I don’t know what I had thought when joining the DNA sites but I think I thought trumpets would blare and canons would go off and a big sign would drop down proclaiming my parents-to say I was disappointed in this would be a very big understatement. So I said, “Heck yeah, let’s do it!” We wrote the check, had papers signed by a notary, and sent them by UPS and off they went! Then it was just the waiting-this was on a Monday-by Thursday night we received a phone call from Hilton, the Hawaiian court appointed investigator, he had good news and bad news-the good news was he found my mother, and he thought he may also have found my father but the bad news was they were both dead-the good news again was that because they were both dead and had not signed “no find papers” my adoption records would be sent to me! He also said that I had a Step-father still alive and half-brother also alive both in Honolulu! Before all this took place, Patty one night having grown quite frustrated with Hawaiian adoption laws, went on Hawaii’s congressional site and sent a brief synopsis of our plight in trying to locate my parents-one Senator replied and suggested Patty contact Senator Mike Gabbard, so she did exactly that-and to our surprise he took a very personal interest in us and our story! So because of Patty’s and Senator Gabbard’s correspondence with one another Senator Gabbard wrote up and sponsored a bill that would allow all adoptees upon turning 18 to file motions through the court to allow them to see their adoption records-pretty darn neat huh? Who would have thought this possible-certainly not me and I was there watching all this unfold before my eyes! So lets’ recap: Patty searches for my parents by phone and letters, Patty searches by computer sites, Patty gets Mr. Reluctant to submit DNA tests-(3) different ones in all-Patty contacts Senator Gabbard (who writes up and submits an open adoption records bill), Patty convinces Mr. Reluctant to send a check to Hawaii’s Court appointed investigator who has 6 mos. But locates parents in 3 days-and has the adoption records sent out from the Hawaiian Courthouse. Is this not totally mind- boggling-it sure is! This was 19 years of dead ends finally seeing light at the end of the tunnel on the road of my crazy life! They say that all good things come to those who wait-I believe in that, most assuredly so! Well, I’d like to say that when the adoption papers arrived all the mysteries and unknown things were solved and cleared up but that isn’t the way it happened- not at all; did you really think it would-this is after all me and my life-things never come easy or go as planned. Hilton had provided us with my brother’s and step-fathers’ names and phone numbers, so when the adoption papers arrived we immediately looked to see who my parents were-My mother was: Agnes Kikue Sugimoto Tomori and my father was: Charles Jessie, and I was Baby boy Sugimoto! There was scant, to little information regarding my mother and her origins, and hardly any information about my father-in fact all information about my father, like address etc. had been redacted or totally eliminated and as we would later discover, all wrong! –This would go from strange to stranger still but not to be unexpected-nothing as you by now know comes easy for us. After reading the adoption records over and over for what seemed like a week Patty finally got through my numbed brain to my consciousness and inquired if I should not call my half-brother Jeff Tomori and tell him what I knew?! So I did-it went badly-he did not pick up nor respond back to my messages that I left explaining who I was and how he needed to call me back so I could explain to him in more detail our connection; frustrated by not hearing back from him I called his father, my step Dad, Takashi Tomori; he to my astonishment did not know anything about me either-and did not believe me! My mother never told either of them-of course not, why would she do that-I sarcastically said to myself, and hung up the phone expecting not to hear from anyone-about an hour or two later Joy, Jeff’s wife called and I ended up telling her the story-she said she would relay what I had told her to Jeff when he would return home that night. Well unbeknownst to me, they called Jeff’s living aunt’s-no they were never told this-then he decided to call my mother’s childhood and best friend, Elsie-who was still alive and living in Oahu also-she confirmed everything to Joy and Jeff-thank God for Elsie-so Jeff finally called and we were able to talk about it all! They even sent pictures so I could see what she looked like-it was a magical, fascinating, surreal day in my life-that after all these years I had a face and a name-I felt like a human being who really had been born after all! Needless to say, several months later we went to Hawaii to meet everyone, unfortunately there no one left alive who can tell me about what happened after my mother’s last trimester! Elsie and my Mom went to Okinawa after graduating from High School as telephone operators for one year serving the U S Army Air Corps/Air Force-it was while there Elsie said that my mother met my father-in one of the on base bars. She became pregnant and left Okinawa back for Honolulu and stayed in the Kapiolani Hospital quarters for unmarried women, during her third trimester. By the time Elsie arrived back in Honolulu, Elsie said everything had been done about me (giving me up to foster care and eventual adoption) and my mother made Elsie swear to never tell anyone-and of course she never did until Jeff called her that night. She said she always had hoped the truth would come out, but she was not going to be the one to tell anyone. While staying in Hawaii we were able to meet and greet Senator Mike Gabbard who prefers being called Mike-how many Senators do you know who prefer that?! Anyway we met with Mike, and I proceeded to tell him our story –I did it but in a very truncated way as I was quite mesmerized by meeting him and was short and clipped with the retelling-much to Patty’s consternation. Mike gave us a signed copy of the original Bill he and Patty and I worked up, and a week after we returned home the Governor of Hawaii signed it into law-so now anyone 18 can request to see their adoption records. We went to Mom’s grave in the Punch Bowl and a strange, fierce, wind blew that day and my phone wouldn’t work until we were almost out the front gates-then it suddenly started to work properly again as we left, so I wasn’t able to get a good picture-we went back again before we left and that time there were no odd incidents –I was able to take proper pictures finally! The one constant throughout this whole ordeal has been no known information about my father. When we went to see Elsie, Jeff, his son Jared, and our Dad Takashi came along too, I believe Takashi’s presence intimidated Elsie to the point she was very reluctant to say anything about him as she may not have wanted to upset Takashi, so consequently I came away with no more knowledge about my dad then when I came. According to the adoption records he was born in W.Va. in 1928, he had a brother and a sister; he was a SSgt in the Air Force and was on a 21 month tour of duty in Okinawa-it didn’t say what month he was in. Charles did pay for my mother’s care in Hawaii while she stayed at the hospital. My mother was not concerned before or after my birth about the baby-me- but was very concerned if Charles would marry her-he did not. My mother evidently was very hard to get information out of, she was very afraid of her father, and told only her mother, an older sister, and Elsie; Charles I would come to find out told no one either. And that is the way it stood though Patty did find 3 Charles Jessie’s that could have been my father- Hilton thought the one that died in 1967 was my father, one died in Pinellas Park in 1976, one died in New York who was born in 1931 but he died very young in 1958, so we thought-we will never find him. Little did we know, never ever say never! Then one day maybe a month ago, Patty was at the computer on 23 and me looking around when she received this message from a Laura Jessee Croll. I was sitting in the recliner in our computer room when she became very excited and said: ‘Jeff you have to come over here and read this right now!” I went over, for if you know Patty this was unusual for her to be this excited! I read it and was stunned at what I read-so I read it again-then still unbelieving asked Patty for confirmation! Sure enough, Laura wrote that we were 2nd cousins. 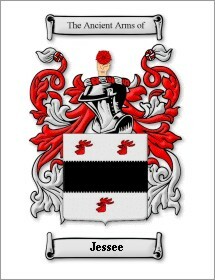 Laura’s father, my cousin was John Douglas Jessee, whose father: John B. Jessee was Charles’ brother! She also said that when he joined the Service, he lied about his age to get in and that when the service found out he had been in so long they didn’t do anything to him about it. His name was changed when he enlisted from Jessee to Jessie, he died under mysterious circumstances from a brain hemorrhage in 1958, the family felt his then wife Theresa may have had something to do with it so all contact with her was cut off-there were two children. So, somewhere I have two more half siblings. Patty has found on Ancestry a Chas Monroe Jessie born in 1931, in Virginia, he had 10 siblings, his father was Walter Jessee and his mother was Minnie Freeman, (he enlisted in 9/18/46-so he was 14 almost 15), he made M.Sgt. by the age 25, he is buried in New York, with the wrong birth date and last name-strange things surround his legacy of which I am a part. His brother John B. Jessee wrote a living journal which has been publish and which Patty and I purchased-his memory evidently was like mine is-so it be where I get it from. Life is a long and winding road and a bit strange as well! There are more twists and turns and people involved in all of this, but for me to expound on everyone involved and all the research and the how’s and whys of all of this would probably take a novel and not just a bit of history, so I will leave this for another time to be shared in some other format and venue. Since being discovered by Laura and her Dad, we have been in frequent contact, needless to say, as everyone, beginning with Laura (who sent us a plaque to hang over our mantel by the fireplace with the name Jessee), and her father have welcomed us to our new family! Laura evidently, as a Christmas present, purchased the 23 and me DNA kit for her dad and herself and after she got the results back was scrolling through the 23 and me when she happened upon Patty’s brief summary of me-she read it, made the connection, and wrote us-unbelievable! All those sayings-“Big things come in little packages”, “Good things come to those who wait”, “Good comes out of bad”-they are all true. I can attest to them! I am living proof of these sayings! Both my parents went to their graves with their secrets, none of them knew that DNA could unlock them to be shared by those of us who were touched in some way by them-if only they knew!-I wonder now, alone at night before I drift off to sleep-what would they think-what would they say? Someday we will meet and I will have a lot of questions to ask, hopefully I will get the answers I seek!